Heat oven to 350°F. Grease and flour 12-inch pizza pan. In large bowl, break up cookie dough. Stir or knead in cocoa and 1 tablespoon food color until well blended. With floured fingers, press dough evenly in bottom of pan to form crust. Bake 15 to 20 minutes or until set. Cool on cooling rack 20 minutes. Meanwhile, in small bowl, beat cream cheese, sugar and vanilla with electric mixer on medium speed until fluffy. Spread over cooled crust. Stir together small amounts of water and food color. Paint color on freshly topped crust, using fine-tip brush, then swirl colors with brush or toothpick to create marbled designs. Spoon 12 dollops of whipped topping around outside edge of crust. In small microwavable bowl, microwave fudge topping uncovered on High about 10 seconds. Dip half of each chocolate bar lengthwise in fudge. Coat with sprinkles. Place candies in dollops of whipped topping at an angle. 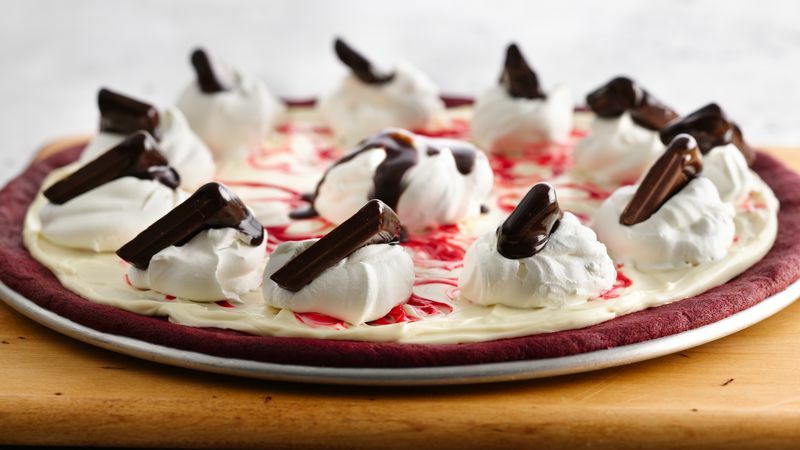 Place large dollop of whipped topping in center of pizza. Drizzle with additional fudge topping, if desired. Store covered in refrigerator. Place a fun colorful candle on center of pizza to celebrate a birthday. For Valentine's Day, use chocolate candy hearts in place of the miniature candy bars.